Although we have been visiting county fairs across all corners of Ohio this summer, on July 19th, we had a short drive from campus to the Franklin County Fair in Hilliard. Franklin County offered a diverse audience of fair goers to participate in the Ohio Soy Sustainable Summer program. Although the fairgrounds are located in the largely suburban town of Hilliard, Franklin County residence from urban Columbus, and rural areas to the south and west of the city were in attendance. We set up our display in front of a livestock show arena, and talked with people as they walked about the fairgrounds. We played our biobased jeopardy trivia game with 4H exhibitors and their parents. One youth 4H member asked, “Mom, why don’t we buy all of our stuff made out of plants?” We also had the opportunity to speak with a soybean producer from Franklin County who shared his enthusiasm for bioproducts and the potential market opportunities they provide. 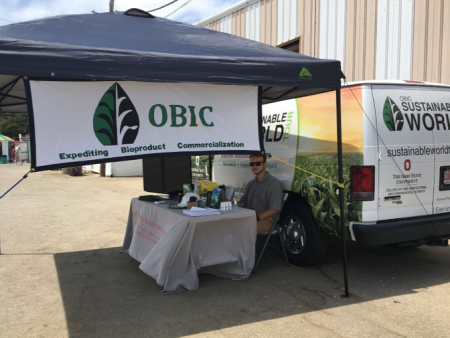 The majority of people we spoke with in Franklin County were consumers, which was very different from our trip to the Crawford County Fair in Bucyrus, Ohio, the very next day. Crawford County, in the north-central area of the state, is considerably more rural than Franklin County. We drove past acres of corn and soybean fields as we traveled north to Bucyrus. We were set up outside for a few minutes before a light rain forced us into the Whetstone building, which is mostly occupied by llamas and alpacas, among other things. The Crawford County Farm Bureau typically hosts activities for area youth in the Whetstone building during the fair. This crowd of young agricultural enthusiasts quickly took interest in our Ohio Soy Sustainable Summer activities. We were pleasantly surprised to find that many of the participants were especially interested in sustainability. Nearly everyone we talked to was a crop producer, or had a family member that farms. 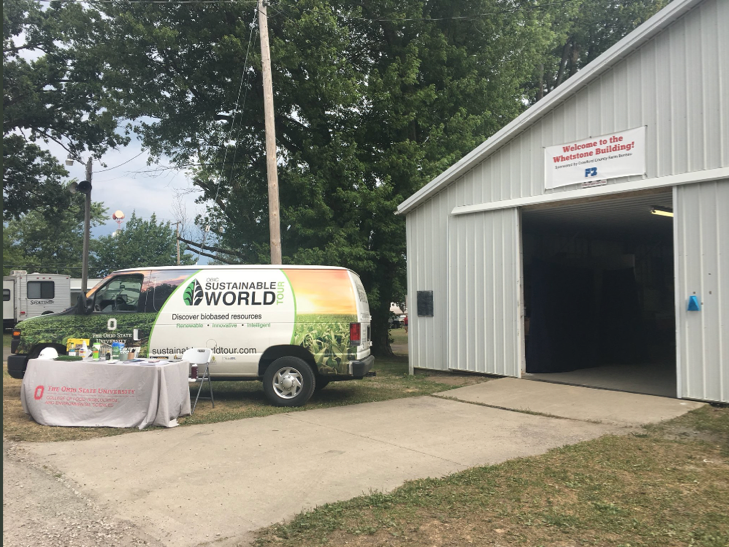 Fair goers are always excited to learn about the different ways agricultural feedstocks can be utilized to create the products we use every day, and Crawford County was no exception. This article was written by Bradley Collins, OBIC Student Assistant and Senior at The Ohio State University.